"Monday disease" is related to which drug? Ans-C Monday disease is a toxicity that happens to those who are exposed to Nitroglycerin or isosorbide dinitrate industrially, like who work in construction or demolition industries, mix concrete, do plaster, ect. During the week, Monday to Friday, they are exposed to the vasodilating action, so they build up a tolerance. If they are off on Saturday and Sunday the tolerance is lost. So when they go back to work on Monday the tachycardia, hypotension, flusing and headache return, but a tolerance is built up again by the next day. The Kveim test, Nickerson-Kveim or Kveim-Siltzbach test is a skin test used to detect sarcoidosis, where part of a spleen from a patient with known sarcoidosis is injected into the skin of a patient suspected to have the disease. If granulomas are found (4-6 weeks later), the test is positive. If the patient has been on treatment (e.g. glucocorticoids), the test may be false negative. The test is not commonly performed. There is a concern that certain infections, such as bovine spongiform encephalopathy, could be transferred through a Kveim test. Vagal nerve stimulation is used in the treatment of which of the following? the cervical portion of the left vagus is stimulated in a pulsatile manner. Axons from Contralateral nasal hemiretina project to 1,4 and 6. 3.Pale infarct seen in all except? 5.Renal histopathology of wegener's granulomatosis? 2.What prevents ADP from leaving the mitochondria in exchange for ATP? 3. Duchhene muscular dystrophy gene has a promoter site mutation, subsequent problem is? Progressive familial intrahepatic cholestasis (Byler's disease) ; an autosomal-recessive disorder caused by an error in conjugated bile salt metabolism, with early onset of loose, foul-smelling stools; jaundice; hepatosplenomegaly; and dwarfism. The onset of the disease is usually before age 2, but patients have been diagnosed with PFIC even into adolescence. Patients should be supplemented with fat soluble vitamins, and occasionally medium-chain triglycerides in order to improve growth. When liver synthetic dysfunction is significant, patients should be listed for transplantation. Family members should be tested for PFIC mutations, in order to determine risk of transmission. Ebstein's anomaly is a congenital heart defect in which the opening of the tricuspid valve is displaced towards the apex of the right ventricle of the heart. The annulus of the valve is still in the normal position. The valve leaflets, however, are to a varying degree, attached to the walls and septum of the right ventricle. There is subsequent 'atrialization' of a portion of the morphologic right ventricle (which is then contiguous with the right atrium). This causes the right atrium to be large and the anatomic right ventricle to be small in size. There is an enlargement of the aorta which may cause an increased risk of abnormality in infants of women taking lithium during the first trimester of pregnancy (though some have questioned this) and in those with Wolff-Parkinson-White syndrome. The Trilogy of Fallot is a congenital heart condition. The first two of these are also found in the tetralogy of Fallot. However, the tetralogy has a ventricular septal defect(VSD) instead of ASD, and it also involves an overriding aorta. 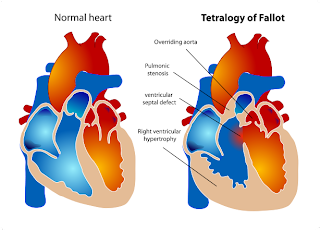 Tetralogy of Fallot is a congenital heart defect which is classically understood to involve four anatomical abnormalities (although only three of them are always present). It is the most common cyanotic heart defect, and the most common cause of blue baby syndrome. 6. Decrease dynamic spasm by Propranolol. CHF is rare in TOF but if TOF is associated with anaemia or myocarditis then there can be CHF with it. 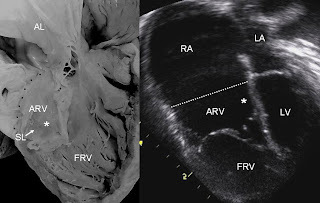 Transposition of the great vessels (TGV) is a group of congenital heart defects (CHDs) involving an abnormal spatial arrangement of any of the primary blood vessels: superior and/or inferior vena cavae (SVC, IVC), pulmonary artery, pulmonary veins, and aorta. CHDs involving only the primary arteries (pulmonary artery and aorta) belong to a sub-group called transposition of the great arteries (TGA). In a normal heart, oxygen-depleted blood is pumped from the right side of the heart, through the pulmonary artery, to the lungs where it is oxygenated. The oxygen-rich red blood then returns to the left heart, via the pulmonary veins, and is pumped through the aorta to the rest of the body, including the heart muscle itself. Transposed vessels can present a large variety of atriovenous, ventriculoarterial and/or arteriovenous discordance. The effects may range from a change in blood pressure to an interruption in circulation, depending on the nature and degree of the misplacement and which vessels are involved. Although "transposed" literally means "swapped", many types of TGV involve vessels that are in abnormal positions, while not actually being swapped with each other. The terms TGV and TGA are most commonly used in reference to dextro-TGA (d-TGA) – in which the arteries are in swapped positions; however, both terms are also commonly used, though to a slightly lesser extent, in reference to levo-TGA (l-TGA) – in which both the arteries and the ventricles are swapped; while other defects in this category are almost never referred to by either of these terms. X-ray showing characteristic finding in case of Transposition of the great vessels which is called egg on side sign. There is no iodine in halothane, which has the chemical structure: CF3CHCLBr. Munro's microabscess are intraepithelium abscesses and associated with psoriasis. It is also associated with seborrheic dermatitis. is a genetic disorder in which both "arms" (B cells and T cells) of the adaptive immune system are crippled, due to a defect in one of several possible genes. SCID is a severe form of heritable immunodeficiency. Diffusion MRI is a magnetic resonance imaging (MRI) technique that exploits characteristics of water diffusion. Diffusion weighted imaging (DWI) helps to image changes in the random motion (brownian) of water molecules. There is inverse relation of water diffusion in ECF (extracellular) and ICF (intracellular). Cells having high NC ratio (nucleus-to-cytoplasm ratio) and high cellurarity tissues have large IC volume, therefore reduced EC volume which result in reduced diffusion of water molecules -- termed Restricted diffusion. Restricted diffusion: increased signal intensity (hyperintensity) on DWI and low signal intensity (hypointense) on apparent diffusion coefficient (ADC) maps. T2 shine through: Hyperintense on both DWI and ADC, is not Restricted diffusion. Digital Imaging and Communications in Medicine (DICOM) is a standard for handling, storing, printing, and transmitting information in medical imaging. It includes a file format definition and a network communications protocol. The communication protocol is an application protocol that uses TCP/IP to communicate between systems. DICOM files can be exchanged between two entities that are capable of receiving image and patient data in DICOM format. The National Electrical Manufacturers Association (NEMA) holds the copyright to this standard. It was developed by the DICOM Standards Committee, whose members are also partly members of NEMA. initially the suppurative labrynthitis caused SN deafness so rinne's +ve. 2wks later due to condition progressing to dead ear , the rinne's will come false negative i.e the a bone conduction response will come from the opposite ear instead. Also in dead ear fistula test comes negative. then it declines and after 12wks its presence in urine is not reliable sign. Clutton's joints is a term describing the finding of symmetrical joint swelling seen in patients with congenital syphilis. It most commonly affects the knees, presenting with synovitis and joint effusions (collections of fluid within the joint capsules) lasting up to a year. It has also been reported affecting the ankles, elbows, wrists and fingers. It is usually painless, although pain in the absence of trauma can occur in a few cases. There is usually no disability associated with the joint swelling, and recovery is usually complete. It occurs between 5 and 20 years of age in both sexes. Based on x-ray evidence, the distal and proximal interphalangeal joints of the hand are most commonly affected by osteoarthritis, though they do not usually exhibit typical symptoms associated with the disease. The hips and knees are the next most common sites of osteoarthritis and are almost always symptomatic. The first metatarsal phalangeal and carpometacarpal joints also are common sites of osteoarthritis observed on x-ray but the shoulder, elbow, wrist, and metacarpophalangeal joints are rare sites of osteoarthritis unless related to injury or trauma. Congenital diaphragmatic hernia (CDH) is a congenital malformation (birth defect) of the diaphragm. The most common type of CDH is a Bochdalek hernia; other types include Morgagni's hernia, diaphragm eventration and central tendon defects of the diaphragm. Malformation of the diaphragm allows the abdominal organs to push into the chest thereby impeding proper lung formation. CDH is a life-threatening pathology in infants, and a major cause of death due to two complications: pulmonary hypoplasia and pulmonary hypertension. The Bochdalek hernia, also known as a postero-lateral diaphragmatic hernia, is the most common manifestation of CDH, accounting for more than 95% of cases.In this instance the diaphragm abnormality is characterized by a hole in the postero-lateral corner of the diaphragm which allows passage of the abdominal viscera into the chest cavity. The majority of Bochdalek hernias (80-85%) occur on the left side of the diaphragm, a large proportion of the remaining cases occur on the right side, and a small fraction are bilateral i.e., left and right sided defects. This rare anterior defect of the diaphragm is variably referred to as Morgagni’s, retrosternal, or parasternal hernia. 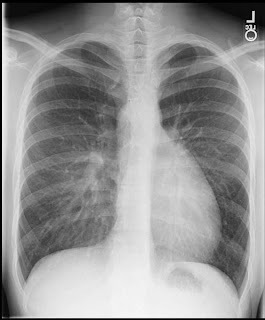 Accounting for approximately 2% of all CDH cases, it is characterised by herniation through the foramina of Morgagni which are located immediately adjacent to the xiphoid process of the sternum.The majority of hernias occur on the right side of the body and are generally asymptomatic; However newborns may present with respiratory distress at birth similar to Bochdalek hernia. Additionally, recurrent chest infections and gastrointestinal symptoms have been reported in those with previously undiagnosed Morgagni's hernia. In asymptomatic individuals laparoscopic surgical repair is still recommended as they are at risk of a strangulated intestine. a line from medial canthers to angle of mandible divides maxilla, used for staging of Ca maxillary sinus. Q.Which of the following is used in the therapy of toxoplasmosis? Toxoplasma gondii is an obligate intracellular parasite. It is one of the most common human parasites in the world. Combination of pyrimethamine and a sulfonamide is effective against acute toxoplasmosis in immunocompetent adults. These 2 drugs work synergistically against the tachyzoite form of T gondii. As an alternative to sulphonamides, clindamycin may be beneficial when used in combination with pyrimethamine. Ans:B .. Dipicolinic acid is exclusively found in bacterial spores. Liraglutide is a long-acting glucagon-like peptide-1 (GLP-1) analog that has been developed for the treatment of type 2 diabetes. Provenge (generic name sipuleucel-T) is an immunotherapy for prostate cancer manufactured by Dendreon. It received U.S. Food and Drug Administration (FDA) approval for use in the treatment of advanced prostate cancer patients on April 29, 2010. It is the first FDA approved drug in its class. Ans: B in boric acid poisoning, the major symptom is erythema, desquamation and exfoliation. The skin of the patient looks like a boiled lobster. Q. Which of the following attains adult size before birth? Q.Which of the following does not predispose to thrombosis? The other three are associated with both arterial and venous thrombi. Other important causes include antiphospholipid syndrome and oral contraceptive pill. Q.What is the most probable portal of entry of an Aspergillus? Aspergillus species are ubiquitous in nature and large numbers of conidia or spores are dispersed in the air so that inhalation is inevitable. About 70% of NF2 patients also have skin tumours. CT scan - Cortical atrophy , Tram track calcifications. Hemangioblastoma of cerebellum , spinal cord , medulla or pons. Q.Most unfavorable position for a vaginal delivery is ? Q. The last primary tooth to be replaced by a permanent tooth is usually ? Q. Why is intrapleural pressure negative? Elasticity of lungs causes them to assume smallest possible size. But opposing force – elasticity of the chest wall pulls the thorax outward to enlarge the lungs.